Yarhisar's construction has been completed in 1907 by Forges Et Chantiers De La Gironde . She was a French Durandal class destroyer. 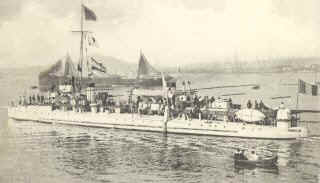 Yarhisar destroyer under the command of Lt. Cdr. Ahmet Hulusi had been sunked in the gulf of Izmit between Yalova and Tuzla by the E-11 submarine under the control of Lt. Cdr. Naismith in 3rd of December 1915. 42 of her crew died which 36 of them being Turks and others being German. The torpedo strucked to the engine room and the destroyer torned in to two pieces. Some of the survivors have been kept heldive by the E-11 submarine. Her coordinates today are 40 45’ N, 29 30’ E.
The photograph belongs to another ship from Durandal Class.